We had the opportunity to talk with the producer of Time Traveller, Collie McCarthy about his latest project. We were able to ask him about the cast, why it was important for him to be involved in this project, and the message he wants his audience to take away from the film. 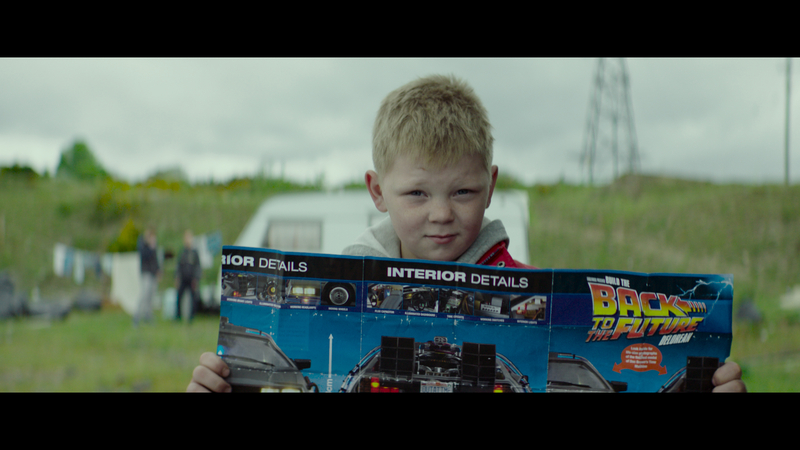 Time Traveller is about a 10-year-old boy from the Irish Travelling Community named Martin who’s obsessed with Back To The Future and is trying to build his own DeLorean replica out of an old scrap car. When his family is told they are to be evicted from the halting site where they live, Martin endeavours to finish his project, creating tension between him and his under pressure-father. It’s a drama with lots of heart and some adventure. We filmed on location in Bray, Co. Wicklow (just south of Dublin in Ireland). We built our ‘halting site’ set in an unused field that was awaiting property development, and filmed the housing estate scenes in one that was located about a mile down the road. It was a big space, a bit of a mess, and right by a motorway so was a great example of being isolated yet in an urban area – which so many halting sites are. It was empty when we arrived so all the caravans, trailers, bits of scrap etc. were brought in by our art department, enabling them to create the exact environment we required from scratch. Our lead character Martin is played by 10-year-old Tom Doran. When we were putting the project together we knew the success of the film would hinge greatly on finding the right boy for the role and it was important to us that we cast someone who was from the Traveling community. We held many open casting sessions over the course of a couple of months but when we finally met Tom, we knew he had something special. Tom had never acted before but he has this innate energy and an emotional intelligence which shines through as soon as you put the camera on him. For the role of Martin’s father, John-Paul, we cast the vastly experienced and excellent, Barry Ward. Barry is a pleasure to work with and he brought real soul to the part which can be seen in the on-screen chemistry that him and Tom share as father and son. We were also very fortunate to be able to cast Denise McCormack to play the role of Martin’s Mam and Barbara Bergin makes an appearance as the woman who Martin has a run-in with when he’s out collecting scrap. For the role of Martin’s brother Frank, we kept it in the family and cast Tom’s older brother Liam Doran. Liam is actually no stranger to being front of the camera having modelled for photographer Perry Ogden on a number of high profile fashion campaigns including Burberry, H&M and Kent & Curwen. Working with Steve is really rewarding. We’ve made two films now and are planning many more. He’s a writer first and foremost, a student of screenwriting, and every decision he makes at all stages of the film’s lifetime is story-driven. After we discuss the initial concept at length, he strikes a great balance between not sharing work too early (so you know what you’re reading is well considered), but asking for your opinion before the plot and character arcs are set in stone. As a director, he’ll carry out extensive research to ensure he knows the world he is creating inside out, and this allows him to then share his vision coherently with his HODs and actors. For me, a good director is one who can make fast, considered decisions. In the heat of the last few days of prep and on set during the shoot, a director might be asked nearly 100 questions a day; their ability to think on their feet and consistently serve the story is essential, and Steve is great at this. Any good partnership is built on confidence, and we both know that the other is doing all they can to make the project the best it can be. Screen Ireland (then the Irish Film Board) funded the film entirely. We were the inaugural project through their ‘Focus Shorts’ scheme. They offer so much more than just money though. Now I’m out the other side, what appeared as the scheme’s strict guidelines and deadlines throughout the process, proved to be a really good education for me in bridging the gap from shorts to features, especially in terms of legal paperwork and general financier collaboration. They were on hand to offer both creative and practical help whenever required, and since completion have really got behind the film on it’s festival run. I hope it’s the start of a long and prosperous relationship between us. With Steve, we’re working on his debut feature – a horror mystery set in the West of Ireland – and his first TV idea. I’m also developing a number of projects with debut writer/director Sam Johnson, a music-infused drama by Eddie Sternberg, and a US set psychological thriller to be directed by Guillem Morales. All the while looking to meet new talent, unearth new stories, and build the Forty Foot Pictures slate.